The years between WrestleMania XI and WrestleMania X8 were interesting for WWE; their competitor World Championship Wrestling were signing wrestlers that had been household names for WWE during the 80s and began edging out WWE in the TV ratings each week with Monday Nitro. In order to compete with what WCW had been offering at the time, WWE decided to go in a new creative direction: Attitude Era, which provided an edgier sports entertainment program compared to WCW and allowed stars like Shawn Michaels, Stone Cold Steve Austin, The Rock, Triple H, and tag-teams including: The Dudley Boyz, Edge and Christian, and the Hardy Boyz to excel and be a part of some of the most talked about matches in WrestleMania history. By 1999, WWE had gained momentum and began getting the upper hand over WCW in the TV ratings each week and eventually led to Vince McMahon purchasing his competition in 2001 ahead of WrestleMania X-Seven, which culminated with the conclusion of the Attitude Era. WrestleMania X8 would mark the final WrestleMania under the World Wrestling Federation name. Although WrestleMania XI is widely considered the weakest WrestleMania of all-time, it still featured a somewhat memorable moment as the main event wasn’t for the WWF World Championship, but it was a one-on-one match between Bam-Bam Bigelow and NFL linebacker Lawrence Taylor, who had retired from the NFL in 1994. WWE redeemed themselves for the previous WrestleMania in a big way with WrestleMania XII. This WrestleMania was headlined by the legendary one-hour Ironman match for the WWF World Championship between champion Bret ‘Hitman’ Hart and 1996 Royal Rumble winner ‘The Heartbreak Kid’ Shawn Michaels. To this day, many consider the Ironman match to be among the greatest WrestleMania matches of all-time. Both Bret Hart and Shawn Michaels brought the best out of each other that night and were able to make every moment of the one-hour long match exciting and had fans at the edge of their seats during the sudden death portion of the match. 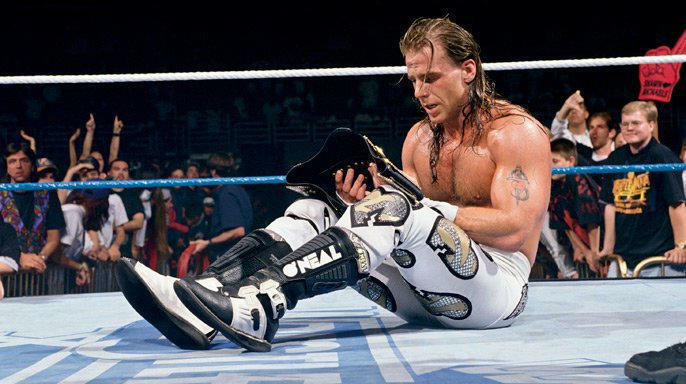 Shawn Michaels defeated Bret Hart to become the new champion and would set the bar for future WrestleMania performers to top and later earned the name Mr.WrestleMania. The event also marked the WWE return of The Ultimate Warrior, who defeated Triple H in his WrestleMania debut, and the event was also the WrestleMania debut of Stone Cold Steve Austin, who defeated Savio Vega. Although it wasn’t the main event, the I Quit match between Bret ‘Hitman’ Hart and Stone Cold Steve Austin was by fat the most memorable match on this card. Both men had been involved in a long feud with each other that led to this match where there was no disqualification, no count-outs, or pinfalls as the only way to win was if one of the men said “I quit” or if they tapped out. UFC Hall of Famer ‘The World’s Most Dangerous Man’ Ken Shamrock served as the special guest referee, which gave the match a legitimate fight feel. It was a well executed match that saw Austin pass out as opposed to saying, “I quit” and ended in a double turn, with Bret Hart turning heel and Steve Austin turning babyface. This match is also significant because it helped contribute to WWE ushering in the Attitude Era and changed the pro wrestling industry. The event is also notable for the WrestleMania debut of The Rock, who defeated The Sultan to retain his WWF Intercontinental Championship. The Attitude Era was in full force during WrestleMania XIV and there were plenty of memorable feuds leading into the event including: Ken Shamrock vs The Rock, Undertaker vs Kane, and Owen Hart vs Triple H. WrestleMania XIV was main event by the WWF World Championship match between champion Shawn Michaels and 1998 Royal Rumble winner Stone Cold Steve Austin. The match also featured ‘The Baddest Man on the Plant’ “Iron” Mike Tyson as the special enforcer, who had been a member of DX heading into this match and was viewed as another obstacle in the way of Austin’s hopes of becoming WWF World Champion. Austin ended up defeating Michaels with a Stone Cold stunner and then closed the show by celebrating with Tyson, who had just knocked out Michales. This was a big accomplishment in Austin’s career because it signified that he was now undoubtedly the face of the WWE. The Undertaker and Kane also faced off and was a match that further legitimized Kane a threating figure in the WWE and somebody who could hold his own with main event talents like The Undertaker. Kane looked strong in this match; he kicked out of two tombstone piledrivers that left Undertaker in disbelief. The Undertaker was eventually able to defeat his brother Kane after a third tombstone piledriver, improving his WrestleMania undefeated streak to 7-0. The First Union Center in Philadelphia, Pennsylvania hosted the fifteenth annual WrestleMania event, which was headlined by the WWF championship match between champion The Rock and Stone Cold Steve Austin. The two had been in a long feud during that time and led to many memorable segments on Monday Night Raw including the Raw before WrestleMania when Austin interrupted The Rock’s promo by driving into the arena with a beer truck and proceeded to spray The Corporation with beer. Their main event match delivered and helped elevate The Rock in the main event and further showcase why Austin was the face of the company. The sixteenth annual WrestleMania event took place at Arrowhead Pond in Anaheim, California and was met with plenty of negative criticism over the amount of multi-person matchups and only one singles match; Catfight match between Terri Runnels and The Kat, which lasted a little over two-minutes. Although the show overall wasn’t great, there’s no denying that the triangle ladder match for the WWF Tag Team Championships between the champions The Dudley Boyz, Edge and Christian, and The Hardy Boyz stole the show. All three teams had been in a series of matches with one another; The Hardy Boyz defeated Edge and Christian in a ladder match at No Mercy the previous year and then defeated The Dudley Boyz in a table match at that year’s Royal Rumble, so they were more than capable of putting on an entertaining match. The ladder match put all six individuals’ talents on full display for fans in that their outside the box thinking changed the way ladder matches are delivered and the high risk maneuvers like Jeff Hardy performing the swanton bomb on Bubba Ray Dudley, who had been on a table, was an iconic moment that has been used in numerous WrestleMania promos and highlight packages. Edge and Christian walked out of WrestleMania as the new WWF Tag Team Champions and the three teams would later wrestle in a Tables, Ladders, and Chairs match at that year’s SummerSlam and again at WrestleMania the following year. To this day, WrestleMania X-Seven from the Reliant Astrodome in Houston, Texas is considered the greatest WrestleMania event of all-time. The event provided something for every type of wrestling fan; the TLC match once again raised the bar for future ladder matches, Kurt Angle and Chris Benoit had a great technical matchup that didn’t rely on high spots or outside interference, and the main event between WWF Champion The Rock and 2001 Royal Rumble winner Stone Cold Steve Austin was an incredible match that lived up to the main event spot. Austin and The Rock were the biggest babyfaces in the company at the time however, Austin won the match after siding with Vince McMahon and turning heel in the process by repeatedly attacking The Rock with a chair and closed the biggest show of the year by shaking hands with McMahon. WrestleMania returned to the SkyDome in Toronto, Canada for the first time since WrestleMania VI and brought a stacked match card featuring many stars making their WrestleMania debuts including: Former WCW Champions Diamond Dallas Page and Booker T, and Rob Van Dam, who had been one of the most popular WWE superstars since making his debut the previous year. WrestleMania X8 was main evented by the WWF Undisputed Championship match between champion Chris Jericho with Stephanie McMahon in his corner and Triple H, who had earned the title shot after winning the 2002 Royal Rumble match. This WrestleMania was also memorable because The Undertaker improved his WrestleMania undefeated streak to 10-0 after defeating Ric Flair in a very entertaining No Disqualification match. Although it didn’t main event WrestleMania, The Rock vs Hollywood Hogan stole the show and had one of the loudest crowd reactions of any WrestleMania match. Hogan had returned to WWE along with the Scott Hall and Kevin Nash as part of the reformed nWo at No Way Out and was challenged to a WrestleMania match the following night on Raw. Heading into this match, nobody could've expected that the crowd would turn on The Rock the way they did; he was the biggest star in the company and was beginning to gain more interest from outside WWE to star in movies. Throughout the match it looked as though Hogan was the face and The Rock was the heel in that the crowd would cheer for Hogan’s offense, but then boo The Rock when it looked like he was getting the better of Hogan. The highlight of the match was Hogan kicking out of the Rock Bottom and hulking up, before hitting his signature leg drop on The Rock to a loud ovation from fans in the SkyDome. The Rock ended up defeating Hogan after a People’s Elbow and then provided a WrestleMania moment for fans by shaking hands and posing with Hogan to another standing ovation.